Published: Sun, September 1, 2013 @ 12:00 a.m. In 2009, Gary Patel’s Super 8 motel in Searcy generated more than $1 million in revenue. But this year, he said he’ll be lucky to reach even half of that. “I don’t think we are going to get close unless a miracle happens,” he said. Patel, who owns three hotels in the city, is one of many business owners who have seen revenue decline in recent years as natural-gas drilling in the state has tapered off. In the 10 Fayetteville Shale counties, signs reading “We buy minerals” and “Shale for sale” are fading as the three major companies operating in Arkansas have moved their drilling rigs to other states. Five years ago there were about 60 drilling rigs in Arkansas. Now there are 11. And as the rigs moved out of the state, so did the jobs. In the Fayetteville Shale, many of the service companies and independent contractors working for the major operators — Southwestern Energy Co., BHP Billiton Ltd. and XTO Energy, a subsidiary of ExxonMobil Corp. — have either laid off employees or are looking for projects in other states, the Arkansas Democrat- Gazette reported. 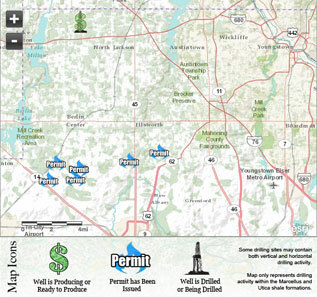 In summer 2012, Premier Well Services employed about 45, after letting go of about 10. The El Dorado-based company now employs 54, but only 22 jobs are in Arkansas. The company has expanded into Louisiana and Mississippi, said owner John Lowery. McLendon, who lives in Greenbrier, said many people in the area built structures for the service companies to lease as offices, and now most are empty. If workers want to keep their income, they have to be willing to follow the rigs because that’s where the jobs are, McLendon said. Two of his neighbors have moved to Oklahoma and North Dakota. “You just move around wherever the work is,” said McLendon, who said he’s earning about $15,000 less than last year because of less work. He said E&P Wireline Services works for several energy companies, including BHP Billiton, which withdrew its last two rigs from the state earlier this year. After not drilling in the shale for about three months, BHP Billiton has contracted E&P Wireline to help “frack” a well this week, he said. Natural-gas drilling in the Fayetteville Shale has been constrained by persistently low natural-gas prices. Analysts say that with prices hovering near $4, Arkansas’ dry natural gas is not as attractive an investment as it was in 2008 during the peak of drilling in the Fayetteville Shale. Instead, companies are focusing on Texas and Pennsylvania, states that are rich in oil and liquid natural gases, which are more lucrative at current market prices. “You go where the work is and the profit is, and it’s just not profitable to drill wells in Arkansas,” Williams said. In 2008, natural-gas prices ranged between $6 and $10 per million British thermal units on the New York Mercantile Exchange, and at least once hit $13.50 per million Btu. In April 2012, natural-gas prices plummeted below $2 per million Btu and failed to reach $4 per million Btu because of warm temperatures and an increased supply. Earlier this year, analysts said drilling in the shale has peaked and isn’t expected to rebound for the next two years. “It will never be as busy as it was, but it’s a steady source of income for the state,” McLendon said. Energy companies have spent billions in the state since the natural-gas extraction procedure known as hydraulic fracturing, or fracking, began in the Fayetteville Shale in 2004. Since the peak of natural-gas drilling in 2008, companies have invested more than $12.7 billion in the Fayetteville Shale, according to a study released last year by the Center for Business and Economic Research at the University of Arkansas at Fayetteville. The decline in spending in the Fayetteville Shale counties in north-central Arkansas was expected, said Kathy Deck, center director. Businesses in the once-bustling shale counties say they are now adjusting to fewer customers and subsequently shrinking revenue. On a recent day, only five people were staying at the 49-room Super 8 motel in Searcy. “This year business is slower; it’s definitely slower,” said Patel, the motel’s owner. After the Super 8 saw a spike in revenue because of shale activity, Patel opened an Econo Lodge Inn & Suites in 2009 and a Knights Inn in 2010, expecting to benefit from the natural-gas drilling. Patel said his three hotels employ about 15, half the staff he had in 2009 and 2010, because there’s less work. Michael Shepherd, who bought Flying Pig Bar-B-Que in Searcy in May with his wife, Chrissy, said restaurants also are seeing a decline in customers.